The first time I ever visited the Parc de Bagatelle, over a year ago, I had ventured out on a self-imposed solitary expedition. Meandering among the the grottoes, the follies, the winding paths, the Orangerie, oohing and aahing over the strutting peacocks, I was transported. It was sublime, everything I'd ever wanted in a French park. Or any park. My garden-induced rapture was jolted by the ringing of my cell phone. It was the friend I was meeting for lunch nearby in the 16e arrondissement. "Where are you?" he inquired. "Uhh, I'm not sure," I replied breathlessly. "But I do I think I've died and gone to heaven." So it's easy to imagine how much I was looking forward to returning to the Parc de Bagatelle for the monthly adventure of "Sundays with Richard and Polly." We'd had the plans lined up for weeks. Directions to the Parc, decisions about picnics on the lush lawns. I was burning to get back to that little bit o' heaven in the Bois de Boulogne on a lovely May afternoon. Then SNAFUs struck. Logistical challenges, out-of-town guests, the usual Paris glitches. So at the eleventh hour, Richard and I decided to stay in the center of town and go to the Sainte-Chapelle for our monthly outing instead. Crossing the bridge from St Germain, I arrived first , and a sizable line confronted me outside the entrance. 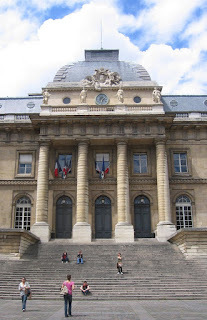 There is a security check to get into the Sainte-Chapelle and the Conciergerie because they are both located within the walls of the Palais de Justice, more or less France's equivalent to the Supreme Court. Patience is a virtue and a learned skill in trying to visit popular Paris spots. Waiting for Richard and Vincent, I struck up a conversation with the couple behind me. Actually, they struck up the conversation: "Excusez-moi, parlez-vous Anglais?" asked the lady in a lovely Aussie accent. I gave her my basic I'm-an-American-living-in-Paris spiel. Relieved, she sighed, "Can ya tell me, then, what IS it exactly that we're standing in line for?" Ahem. I know I usually think I've heard everything in Paris, but this was a new one. She and her darling husband were obligingly standing in a long line of tourists -- let me get this straight -- because they saw a bunch of other tourists and figured it had to be a Worthwhile Thing to See? But they had no idea what? I sputtered as I sought a reply. Then I realized, hey -- come to think of it, maybe that's not such a bad tourism tactic after all. Ditch the guide books, and follow the crowds. Ask a knowledgeable person -- and presto! -- you've seen Paris. Anyway, Richard and Vincent lucked out because by the time they arrived I had advanced our spot in line close to the front. We both admitted that we hadn't visited the Sainte-Chapelle since we'd been here, an embarrassment somewhat mitigated by the fact that the church had been closed for renovation for a while a few years ago. We chatted about our Hall of Shame -- the must-see Paris sites that we haven't visited yet. We finally made it through the metal detector and experienced the mini-frisson of being frisked by the handsomest of the two gendarme security guards. At least one of us wanted to return for a repeat performance. I'm not telling who. When you enter the ground-floor level of the Sainte-Chapelle, the first inclination is to hum along with Peggy Lee in "Is That All There Is?" 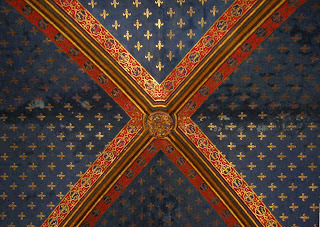 The vaulted ceilings and the boutique are pretty, to be sure, and the medallion-maker tempting and very busy, but there isn't an automatically-revealed sense of some other incredible space to visit beyond the low-ceilinged chamber, with its enticing polychrome frescoes that look like like rich tapestries. Knowing the glorious stained glass windows of the Sainte-Chapelle from Art History class eons ago, I knew we had to figure out how to get to see them somewhere in the building. We spotted an inconspicuous narrow stairway in the corner, and made the climb to the upper level. Have you ever imagined what it is like to be inside the tumbler of an exquisite kaleidoscope? I hadn't. But that is precisely the whirling visual impression I got upon entering the chapel. There are practically no walls above about eight feet -- just stained glass. A myriad of jeweled glass designs and biblical stories far too detailed to write about here. I spun around and walked around and gazed upward until finally Richard urged, "Come, sit." I sat, in one of the chairs lining the length of sanctuary. A wise decision. Please, if you visit the Sainte-Chapelle, do yourself a favor and take time to plunk down and simply stare at the glass. For a good long while. You'll see much more than if you snap away for photos of the stained glass with your digital camera. Slow down and absorb all the intense visual stimulus. There is no book, no slide show, no video tour that could replace the first-hand experience. Sainte-Chapelle was a good decision. I'm happy, in a way, that my photos of the stained glass didn't turn out well, because nothing can attempt to capture being there. I took close-ups instead of the fleur-de lys patterns and angels. Finally oxygen depletion and sensory satiation forced us to reach the departure-decision. This meant descending the treacherous stairs opposite the ones we had climbed. So worth it, despite the vertigo. Sainte-Chapelle was by no means an "oh-well" destination, it turns out. I realized why it's on the must-do lists of sites in Paris. So I'm now inspired to go to visit all the other sites on my Hall of Shame... after I take a quick jaunt to Bagatelle, of course. Now, let's go see what Richard wrote about our Sunday. If you have time to go Polly, it is absolutely wonderful to listen to the music in such a beautiful place. We went to Ste-Chappelle a couple of times. First to witness the stained glass windows, which was kind of disappointing since it was cloudy and they are much more vibrant when the sun is shining through them. The second time was to enjoy a concert in the lower level. It, too, was marvellous; a must do for any tourist (or one who lives here who has never done it). When I started reading your blog this morning, I took a big gulp since I had just posted about my Sunday visit to Bagatelle. Whew! As for standing in line to find out what the big deal is, my mom and step-dad used that tactic when they moved to L.A. years ago. That worked well for them until one day they realized they'd been standing in line to meet Big Bird. Thanks for the account of Sainte Chapelle. The only time I went there was also "imprévu." There was some sort of a strike in progress and everyone got to visit for free that day. It is intensely breathtaking. When visited the jewel box, I lay flat on my back, dead center in the middle of the floor. My eyes raked all around in 360 degrees. It was absolutely over whelming and quite spiritual. I lay there for probably five minutes. I encourage you to try it the next time you visit. Everything is soaring up. A, I just love the Big Bird anecdote. I'd never heard of that method before, but I guess a lot of people find that it works. What an incredible idea. It would have been taking my life into my hands to lie on the floor of la Ste Chapelle last Sunday -- hundreds of people swarming the place, certain not looking where they were stepping. Thanks so much for the post. We were at Ste-Chapelle last week, and had a very similar experience. I was laughing as I read to my wife. The wait in line; the same "Is that all there is" comment (although we also knew there was more to see, but did not know where); the experience of walking into the chapel for the first time and seeing what beauty is there. She sat; I took pictures. We can't wait to see it again. Always the highlight of any of my trips to Paris is a visit to Ste. Cappelle. On my last two visits, I was fortunate enough to attend the classical music concerts there. It is simply breath-taking, listening to the music of Bethoven or Vivaldi, with the stained glass windows of Ste. Chappelle as the backdrop. Catching the 7:00 pm performance is the best option, as the windows are still illuminated by the sun at that time. Then, as the sun sets, the illumination slowly fades to black, but my smile of contemtment lingers long after the last curtain. I'm currently planning my up-coming visit for this March, and, so far, haven't been able to find info for any performances. So, if anyone has any info on perfomrances for March, '10, please share. George et moi -- What Else? Is it a drag to drague?